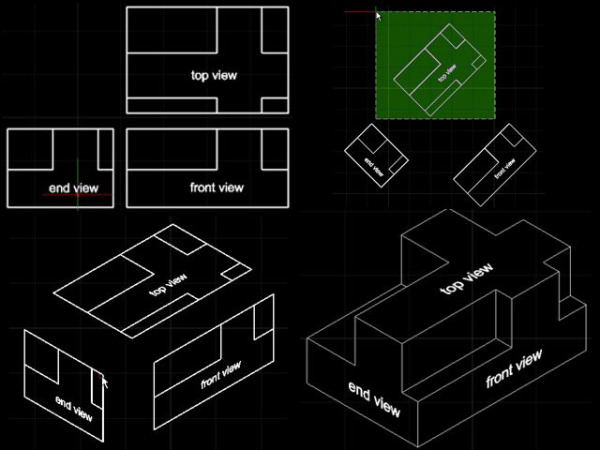 The following IntelliCAD end-user tip and trick is a 2-D construction technique that manipulates the top, front and end views with a series of rotations and non-uniform scaling factors so that the resulting geometry can be combined to give the appearance of a 3-D isometric drawing. You start with the 2-D drawings of each of the top, front and end views. You rotate the top view in a counterclockwise direction of +45°. You repeat a similar rotation of +45° for the front view. The end view is however rotated in a clockwise direction of -45°. You then turn each of the views into a block by using the block command. Give each block a name corresponding to its view. Then insert the top view block with a Y scaling of 0.57735. Be sure to leave the X and Z scaling at one. Also ensure rotation is 0°. Then insert the front view block. This time the X scaling should be 0.57735 with the Y and Z scaling at one. Rotation for this block should be -30°. Place this block in the drawing below and to the right of the top view block. Insert the end view block. This also has an X scaling of 0.57735 with the Y and Z scaling at one, but the rotation is in a +30° direction. Insert this to the left and below the top view. The blocks can now be snapped together and exploded to allow familiar 2-D modification techniques to trim and add lines as needed to give the desired 3-D isometric appearance. If you are interested in purchasing IntelliCAD you can locate an appropriate IntelliCAD technology consortium member via the following website members.IntelliCAD.org/members.